Ten years ago, gecko hobbyists communicated with each other primarily through gecko-related forums such as Faunaclassifieds, GeckosUnlimited and GeckoForums. Ten years ago, Facebook was used exclusively by college students to keep up with their friends. As we enter 2016, the situation has changed drastically. The term ‘micro gecko’ can refer to members of the genus Tropiocolotes. The two species that I keep are Tropiocolotes tripolitanus and T. steudneri. These are a couple of the most common species of micro geckos available in the industry. Many are imported as wild caught adults, however small numbers of captive bred young are produced each year. The previous article discussed gecko hatchlings that have problems due to improper husbandry or visible deformities. This article addresses the most puzzling and frustrating type of hatchling problems: hatchlings who don’t thrive for unknown reasons. As easy as it can be to put a male and female gecko together, stick the eggs in the incubator, wait for the hatchlings and raise them to adulthood, inevitably some of the hatchlings have problems. They’re born with deformities, they don’t eat, they don’t grow the way they should. More and more often, I hear people saying that they want to start their own reptile rescue. While having additional reptile rescues would be absolutely amazing as the few that exist are struggling to meet increasing surrender requests, rescue is more than just taking in reptiles in need. Starting, and maintaining, a rescue requires extensive planning, paperwork, time, space, money, and lots and lots of patience. 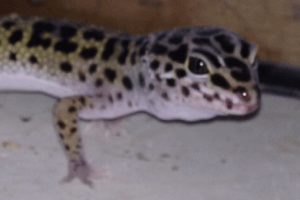 Anyone involved in the online leopard gecko community can recite the ideal leopard gecko setup: paper towel or tile, belly heat controlled with a thermostat, a dry hide, a humid hide, and a water dish. This simple setup works, and it has saved the lives of many leopard geckos previously kept in inadequate conditions due to ignorance. Still, many keepers wonder about creating more naturalistic enclosures. Geckos with the new “pastel” single gene were officially released by Ron Tremper in 2014. The project started back in 2008 with a raptor baby which hatched out with a bright blue belly color through spontaneous genetic mutation . His pictures went across the globe and raised a huge interest in the global gecko community at that time. The bright blue belly-coloration faded after some weeks, but the animal and some of its relatives expressed a different pattern combined with a generally improved coloration of the animals. The project has been selectively bred and developed since 2009. Recently I got a gecko-related communication from my downstairs neighbor. This is not unusual, since I get frequent requests to come down and remove dead crickets from the lamp fixtures or live ones from under the refrigerator. Ray Roehner, the Leopard Gecko Advisor, is responding to questions that come up in our comments section. 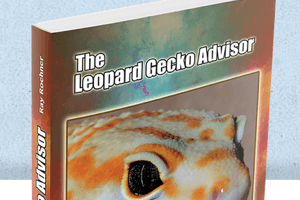 If you have a question about leopard geckos, post it in the relevant comment section and we will consider using it in a future Leopard Gecko Advisor column. Sandra Sanz is an upcoming scientific illustrator from Valencia (Spain), primarily known for her work with the Eublepharidae family. You can check her work in her Facebook page.